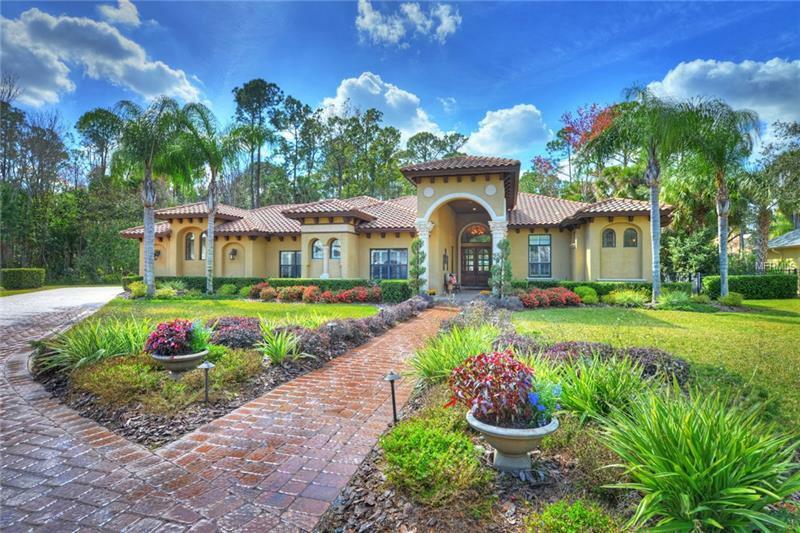 Beautiful custom Mediterranean estate developed by Signature Homes in 2007 sits on a 0.8 acre of land nestled in the back corner of the cul-de-sac in the gated community Lake Forest. The property features 4 bedrooms, 3.5 bathrooms & professional interior design throughout. This house also features a one of a kind custom built bar & a state of the art custom home theater that comfortably seats seven. On entering, you are greeted by custom wood doors welcoming you into the spacious living room overlooking the lagoon style pool with sun shelf & Pebble Tec finish. The screened in pool area is designed perfectly for entertainment. It includes a fireplace & custom stainless steel grill area. Special architectural features include hand troweled columns, coffered ceiling, handcrafted wallpaper, new hardwood floors, extensive crown molding & remote controlled blinds throughout. Master bedroom has French doors leading out to patio, his & hers walk-in closets with wood shelving to the ceiling to utilize all space. Master bath features dual vanities with granite countertops, custom towers, center tub & walk-thru shower. The Executive office includes a partnerâs desk with built-in shelving & wood flooring. The kitchen boasts a 5 burner gas cooktop stove, pot-filler, hidden pantry, integrated appliances, custom cabinetry, granite counters, breakfast bar, center island & butlers pantry. The family room features a gas fireplace with elegant shelving on either side. This beautiful estate is absolutely breathtaking.